Who does not like Pizza? The delicious crust, the tangy sauce, the juicy toppings & the cheesy crust mmmmmmm. But what stops us from enjoying this delicacy is the extra fat from the fast food chains & let's not forget, its never easy on the pocket as well. Like everyone me & my family tried to make the pizza at home, but we always got the base from outside. Now that base is as good as a pita bread / Big bread slice depending on where you get it from. I always wanted to make the pizza from scratch at home & my latest purchase, my beloved oven made it possible for me. Here's a simple easy to follow recipe. Add sugar, salt & yeast to the warm water & mix gently. Cover it up & leave it undisturbed for 10-12 mins. Try to use a transparent cover so that you can check whether yeast is bubbling or not without disturbing the cup. PS - If your yeast has not foamed & bubbled, it won't raise so start again with new yeast. Take the dry flour in a large mixing bowl & add the oil & the yeast water. Start kneading the dough similar to how you would knead it while making Roti / Chapati / Bread. If needed use a little extra water. Knead the dough until it's smooth & elastic for 3-4 mins. Take a ziplock bag & oil the insides well. Now rub olive oil on the dough nicely & place it in the ziplock bag. Leave it in a dry & warm place, I kept it inside my oven itself. Leave the dough undisturbed for at least 2 hours. By this time the dough will have doubled in size. Place the dough on your rolling board & divide it into 2-3 pieces. Dust your rolling board with a moderate helping of flour & gently start rolling it out like a Roti / Chapati. Take a nonstick pan & add olive oil & garlic to it (add garlic to the cold oil itself to get the best flavour out of it). Once the garlic starts to sizzle add in the finely chopped onions, cook the onions till they become translucent. Add in the tomatoes & salt, cook till the tomatoes get pulpy & start separating. Add in the dry spices & cook for about a minute followed by ketchup & mustard. This is a step which depends on your taste. You can cut some toppings small, some big, do them anyway you like. I went for a capsicum, mushroom, jalapeño & chicken sausage topping. I sautéed the mushrooms & capsicum lightly in the pan that I had used to make the sauce. This helped give my mushrooms & capsicum another dimension of flavour. The jalapeños & chicken sausages were cut into small bite size pieces. Preheat the oven to 180 degree C for 8-10 mins with all the four rods elements on. Dust your baking sheet with some flour & place your rolled out pizza base on it directly. (Alternatively you can also roll out your base & place it on the butter paper & then layer, this step avoids mess & prevents the base from burning. )Add a generous helping of the sauce & spread it all over the base. Make sure to leave half inch space around the edges. Put all your toppings & then top with cheese. Optionally you can brush the non sauce covered area of the base with some olive oil / Garlic oil for the extra flavour. Remember to do this as quickly as you can & do not let your topped pizza sit on the tray as it may lead to soggy pizzas. Place the baking dish in the oven & cook with all four rods on for 7-8 mins or till your pizza starts to shrink a little. Switch to top 2 heating rods & cook for 3-4 mins or till the outer crust starts to develop a little color. Take out your pizza from the oven & drizzle with some extra virgin olive oil. Making pizza at home may sound complicated but its really easy. Do try this recipe & let me know how it works out. Hi everyone, it's been a long time since I have added anything here. Basically I am adding the recipes which I have perfected. Being a young working women, I am not always able to make my recipes perfect. Wash the tomatoes & keep aside. Basically we need to blanch the tomatoes. This can be done in two ways, either we put them in boiling hot water or cook them for 2-3 mins in microwave. The important thing to remember here is, before we proceed with blanching, we need to remove the top green part & on the bottom side we need to make very thin cuts in a cross shape. This is to loosen the skin of the tomatoes so that they are easier to peel. So once we have prepared our tomatoes we need to blanch them & then set them aside for at least 10 mins so that they get cooled. Once the tomatoes have cooled down, take out the skin as much as you can. Add the blanched tomatoes, garlic, ginger & green chillies to a blender or chopper & process till its a smooth paste. We need to cut off the roots & wash it properly. Next we need to take about 100-150 ml (small cup) of water & heat it in a vessel. Once the water is hot we add the washed spinach to it & cover with a lid. The idea here is to partly steam & not exactly boil the spinach, boiling the spinach takes out most of the flavour so we should use as little water as we can. Once the spinach is reduced to half & still looks green, we need to turn off the flame & let it cool. Once cool, we need to grind it to a fine paste in the blender or chopper. If you need additional water, use the one in which we boiled the spinach. Take the paneer out & dunk it in warm water if you have time. Otherwise just cut into small cubes. Take a kadhai & add the ghee/oil to it. Once the ghee is hot, add the jeera, please ensure that the jeera floats up in the ghee otherwise it will taste a little raw. Next add the thinly sliced onions & cook them till their edges start turning a little brown. Cook till the mixture starts to leave the ghee / oil. Add the pureed spinach to the mixture & mix well. Cook for less then 1.5 mins & add the paneer cubes. Mix everything and cook for less then 2 mins on medium flame. 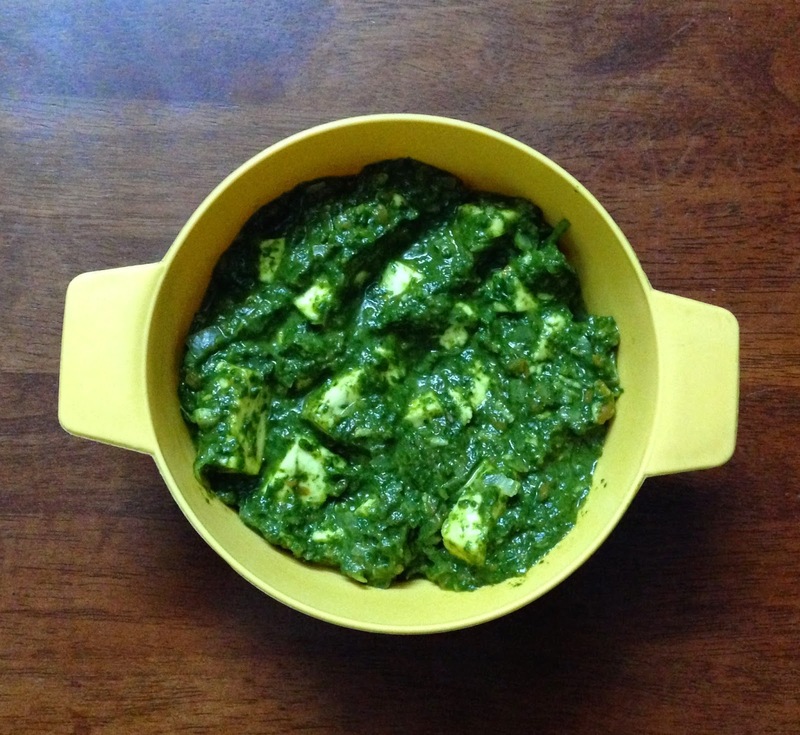 Open the lid after 10 mins & your yummy Palak Paneer is ready to be served! It's very simple & will not take more then 20 mins from start to finish. Tastes excellent with roti or paratha. Vegetables: Capsicum, Green Chillies, Onion, Beetroot, Tomato, Gobhi, Yellow & Green Peas, Boiled Potatoes, Ginger Garlic Paste, Fresh Coriander. Spices: Pav Bhaji Masala, ,Turmeric, Red Chilly powder, Kasuri Methi. Turn off the flame & garnish with chopped coriander & half lemon juice. 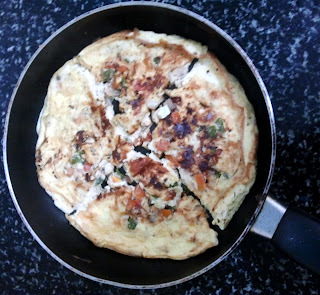 So today I will be sharing the recipe of Italian omelette ( Frittata). This is a simple dish and makes an awesome breakfast/brunch. Goes really well with simple wheat toast for breakfast or with pasta as brunch on those lazy sunday mornings. Heat some olive oil in a deep flat pan and add the garlic, let them fry in the oil till they start getting golden spots. Next add in the onions and wait till they get translucent. Add in the chopped capsicum and any other vegetable you want to add except for tomatoes and mushroom. Mix everything well and cook for about 30secs. Sprinkle the herbs all over the vegetables followed by cheese. Mix everything well and cook till cheese completely melts and coats the vegetables. Beat the Eggs, Milk, Pepper Powder, Roasted Cumin powder and salt together nicely and pour all over the vegetables in pan. do not mix, the egg mixture will find its way between the vegetables, dont worry about it. Now cover the pan with a lid and leave for about a minute. 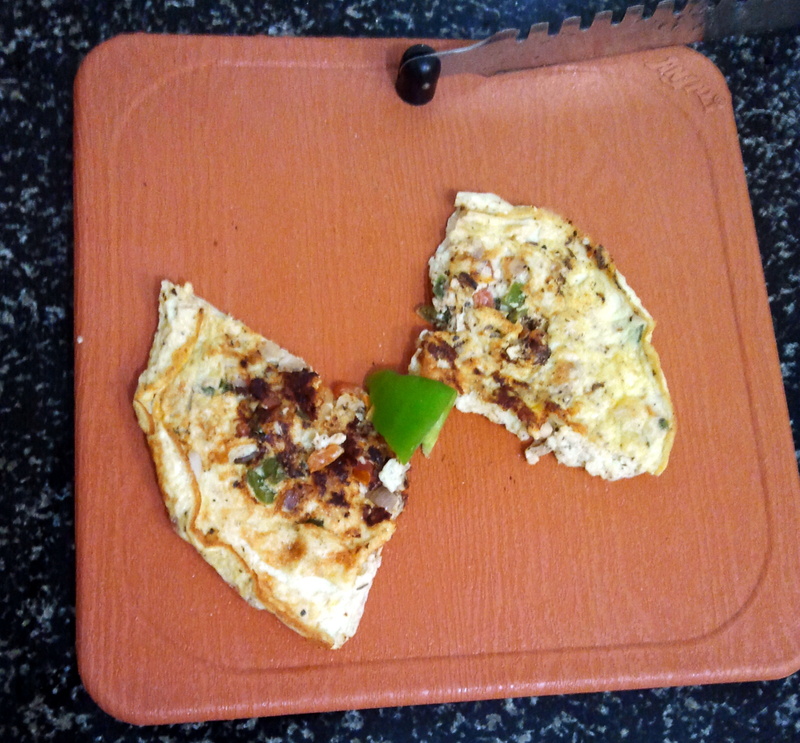 Remove the lid and check if the lower side of Omelette is cooked. Now this part is a little difficult, since the Omelette is so big, its really difficult to flip it over with out breaking it, so i cut the Omelette into four pieces and then flip each piece. Cover again with the lid and cook on low flame for about a minute or as desired. Serve with some fresh Juice or Hot coffee along with Wheat Toast or Pasta. Golden Rules & Tips for cooking!! 1. Oil: any oil should be smoked first before adding any ingredient to it. 2. Herbs: Should always be crushed in between warm palms before adding to food. 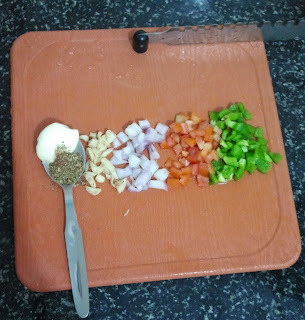 Cutting the herbs with knife makes them loose their color and a bit a flavour on our chopping board itself. Instead tear the leaves apart with your own hands. It feels good and tastes better. The whole spices we use are often kept in storage for long time. So before we start using them, just dry roast them till you start getting their aroma and then pound them using pestel & mortar or add just like that to the dishes, you will see that the taste of spices has been greatly enhanced. I'll keep updating here and looking forward to getting to know more & more handy tips from all you. Quick & Easy Spaghetti / Pasta ! Lately I have had lots of work at office, as a result of which when I come back home, I am just too exhausted to cook anything with a long recipe. 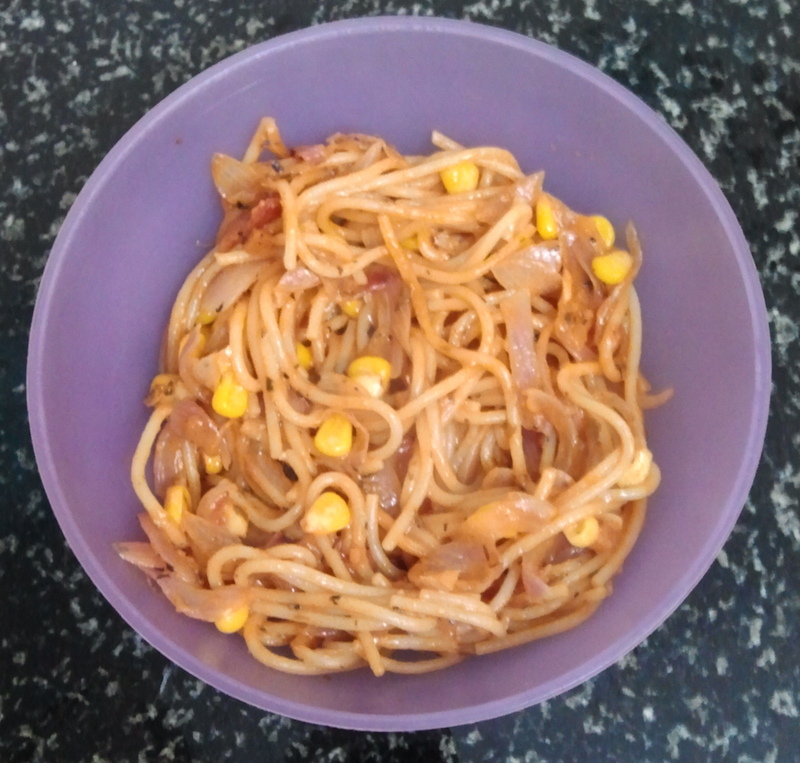 So I make this 10-15mins time taking spaghetti. Its easy, quick, filling & delicious! note: if using sausages, add them just 2-3 mins before turning the flame off. There is no harm adding the sausages before, its just then they loose all their flavour. Adding towards the end helps retain their own flavour & yet it absorbs the juices for enough time to blend in. Cut the onion in long thin slices, crush the garlic and cut the other vegetables as you like, just make sure the pieces are not too big. While the spaghetti gets boiled in the pressure cooker, heat about 2-3 tbsp olive oil in a frying pan. As soon as the oil starts to smoke, add the crushed garlic cloves followed after 5secs by long thin sliced onions. cook the onions till they start to shrivel a bit. Add in the herbs and let them fry a little in the garlic onion oil mixture. Add the tomatoes n 1/4 tbsp sugar & wait till tomatoes start dissolving. Next add the cut vegetables and meat/eggs and cook them till they are also al dente. If using boiled meat/eggs, add them after the vegetables are al dente as they dont need much cooking. Add the spaghetti to the mixture and mix well with all the ingredients. Add in the cheese and keep mixing till all cheese has melted and has coated the vegetables and spaghetti. Now add the chosen pasta sauce and mix well and let it stay for 30 secs. Next add the tomato ketchup/readymade pasta sauce and mix. Follow by 1 cup of water ( the quantity should be such that 1/8th of the spaghetti gets covered, our aim is to form a sauce which isn't too liquidy but at the same time the pasta should not feel dry.) Add salt to taste. Bring to a boil as you constantly keep mixing, add the sausages if using any. Turn off the heat and add broccoli / brussel sprouts and mix. Now is the time to get a bowl and enjoy a delicious easy to cook meal. Tadaa!! I just use the garlic & onions & sometimes frozen corn to cook after coming from office, & trust me folks, it tastes really good! I am writing after many days. Finding very little time to write as the work keeps me really busy. So here I am posting about the easy to make & good to eat sheera. Take a deep bottomed pan ( preferably non stick) and add the suji and powdered cardamom, you can add cardamom at the end to. Add the pinch of turmeric now if you are using it, if using saffron soak it in milk n add when you add milk. Roast the suji for about 3-4 mins till you just start getting the aroma of roasted suji. Add the ghee now and mix well with the suji. P.S if you wanna add dry fruits like resins, cashew nut, almonds etc, put them in while you add ghee, no need to fry, roasting them in ghee along with suji gives them a nice delicate flavour and does not make them heavy. So here it was, the easy and quick to make sheera/ suji ka halwa/ kesari bhath/ semolina pudding. This is my blog where I will be posting my experiments and experiences in my kitchen & cooking. Hope you all like it and have as much fun trying my recipes as I did while creating them. P.S I never like using 200gms, 300gms etc in my recipe, coz let's be honest, most of us don't have those measuring instruments at home, & even if we do, it's too much work to take them out from their hard to find hiding places, hehe :) so here I am using easy to get measuring systems, hope you all like it. All comments, suggestions and tips are very much welcome.